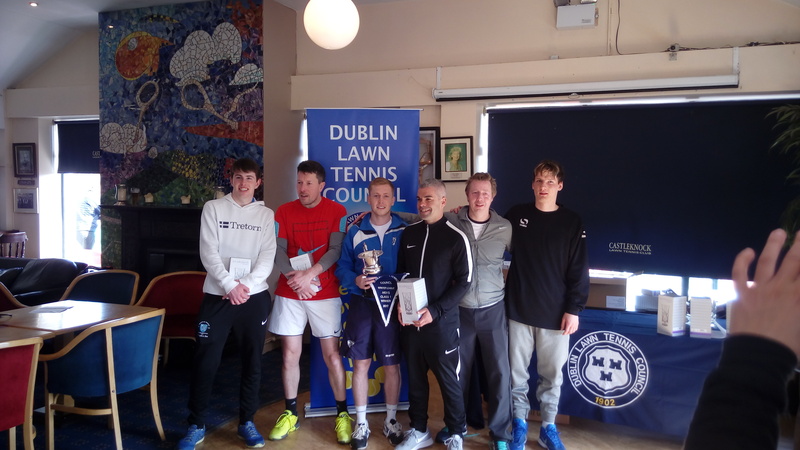 As you may have heard Naas LTC’s Men’s first team won the DLTC class 1 final at Castleknock today, beating a very strong Fitzwilliam 1st team 2-1. The first doubles pairing, and first to finish, for Naas were the team co-captains Jack Hughes and Paul Fitzgerald. Despite losing the first set 6-3 the two combined very effectively to win the second and third sets 6-4 6-3. First blood to Naas. The second doubles pairing for Naas were Declan Gardiner and Dorian Kos. They had a nightmare first set, losing 6-1. In the second set they managed to battle to 6 all and, despite going 5-1 down in the tie break, they fought back to win this set 7-6. Unfortunately they lost the third set 6-2. The third doubles pairing, and the last to finish, were Alan Donnelly and Ari Knox. They won the first set 6-4 but lost the second by the same score line. At 4 all in the third Naas managed to break serve, with Alan Donnelly serving for the match. They came up against two very determined Fitzwilliam players who managed to break back. After another tough game Naas broke again, with Ari now lining up to serve for the match. Again Fitzwilliam came back strongly and forced a break point, which Naas managed to save. At this point the crowd were feeling anxious, we can only imagine what the players were feeling! After gaining an advantage in the game Naas won this game with a stunning smash from Alan, which can be seen on our Facebook page (https://www.facebook.com/naastennis/). On behalf of the club we would like to say congratulations to the players involved today, and to all players who played league this year on your performances. We would also like to say thank you to everybody who came up to watch the match and support the team today. It was obvious that Naas had a very high number of supporters at the match, the roar that is heard in the video on Facebook does not do what was heard at the final point justice. CARDIO MORNING starts this Thursday the 23rd at 10am! You can sign for 4 weeks (cost 36 euro) or book your place day before (cost: 10 euro per session) via text to Maya. If you are interested in group coaching we have the last places left in the INTERMEDIATE GROUP with Dave Doyle on Saturdays from 2.30 to 4.00. SEE YOU ALL ON COURT!!! The finals of the mixed doubles tournament will be on this Friday the 24th of March at 19:30. Feel free to come down to support the players and to meet our new captains and other members of the executive committee who will be here. Social tennis will also be on as usual, entry via the usual method. To see who has reached the finals follow this link: http://ti.tournamentsoftware.com/sport/matches.aspx?id=ACF1AC76-F690-4B43-9813-B13A631164EE&d=20170324, finalists will be available from Thursday. 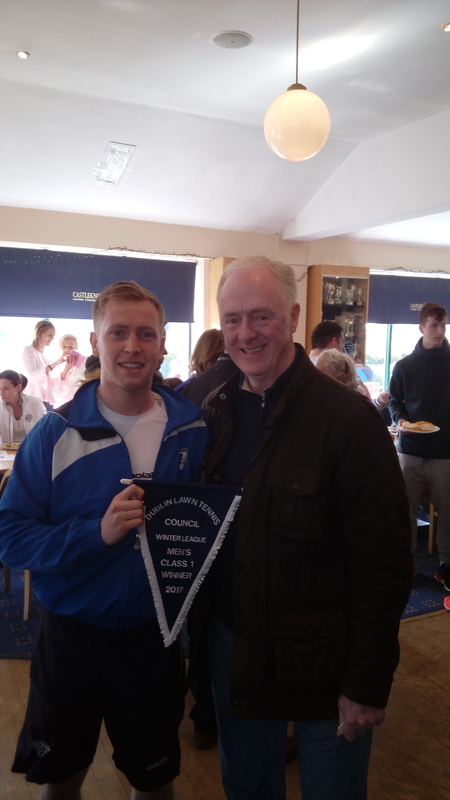 The sign up for this years Naas LTC Spring Championships has now started, once again kindly sponsored by REA Brophy Farrell in Naas and Newbridge. This is a graded Men’s and Ladies singles and doubles event. To sign up either write you name on the sheets on the notice board or email your entry to the usual competitions email address stating whether you wish to play singles, doubles or both and if applicable who your partner is. The tournament starts on Monday the 3rd of April with the finals on Saturday the 6th of May. Full details are on the notice board. Congratulations to the Naas LTC Men’s first team who have reached the finals of the 2017 DLTC Winter League. They will be playing Fitzwilliam on Sunday the 26th of March at 11am in Castleknock LTC. Both the club and the players would appreciate as much support as we could possibly show on the day. The players involved are Jack Hughes, Paul Fitzgerald, Dorian Kos, Declan Gardiner, Alan Donnelly and Ari Knox. We would also like to congratulate the Ladies 1st and 4th teams who made it through to the class one and class 3 semi-finals only to be knocked out by Malahide and Deerpark respectively. The Ladies 4th team are now promoted to class 2 which means next year we will have two class 1 and two class 2 ladies teams, which is a phenomenal achievement for any club. Well done to the Men’s 3rd team who were knocked out at the class 4 quarter final stage (their promotion match) by Elm Park. They will be back stronger and fitter for next years campaign. Well done to all league players on your performances this year, it is good to see so many new players come through and not alone play but do their club proud with their performances. We had no teams relegated this year, one team promoted and 1 team in the final, keeping up the clubs proud record in Winter League.